I tried to use Reshade with K-Shoot MANIA, a Japanese rhythm game. Without success. Note : You must have an audio device enabled in order to run the game, anything works even a broken jack. Is the game supported ? If not, will it be one day ? Any workaround for this issue ? After a quick investigation, the game seemingly uses GDI+ for the rendering, thus no compatibility with ReShade. Last Edit: 2 years 4 months ago by Uwy. Doesn't appear to be a D3D9 game. Try the other rendering API options. I just retried the others (Direct3D 10+ and OpenGL), doesn't work either, no log file in both cases. On http://kshoot.client.jp/troubleshooting.html it indicates (for another issue) that DirectX9 available at https://www.microsoft.com/en-us/download/details.aspx?id=35& and must be installed so it must uses DirectX8/9 API, right ? The DirectX runtime may not be installed. → Download and install from here, please try again. Alternativly there may be some third party overlay software running that overwrites ReShade's hooks and that's why they are not triggered. Make sure you have no such (overlay, recording, game booster, etc.) software running. No overlay is running AFAIK. I used to have GEXP with shadowplay but uninstalled it. Steam is not running either. 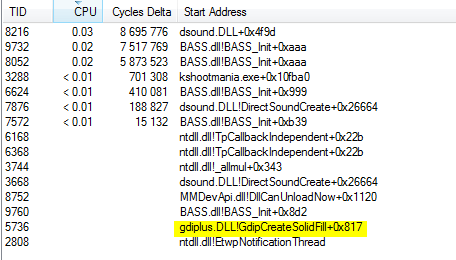 I'm not quite sure, but I think GDI+ isn't DirectX based, am I right ? Is it the reason it doesn't work ? Wait. If the game uses GDI+ for drawing then yes, ReShade cannot work on it.